Meet our newest employee Lillian van Wyngaarden our communications coordinator. Lillian will graduate from Otterbein University in just a couple of weeks with a Bachelor of Arts degree in Journalism and Media Communication with a minor in Creative Writing. While in college Lillian was an intern and freelance writer for Dispatch Magazines and was an editorial intern at Great Lakes Publishing. Lillian is from Lima, Ohio where she lived with her parents and sister and she is excited to start her career in Columbus. Favorite part of your current job? The atmosphere and friendly work environment. It’s great coming in and already feeling comfortable and ready to take on anything! What do you do when you are not working? I love writing. I also love reading anything I can get my hands on, so I’m always open for book recommendations! I also enjoy watercolor painting, running, exploring the city and going to concerts. What is your favorite quote? “Everything is beautiful when you look at it with love. If you can enjoy the presence of a cat, a bird, a flower…what can I say, all the world will be yours.” – From the documentary Kedi. Where is your favorite place to dine out? I love fun, quirky places—so one of my favorites is Mikey’s Late Night Slice. Where is your favorite place to vacation? Anywhere and everywhere! I like going where I’ve never been before. Some of my favorites include Japan and Scotland. 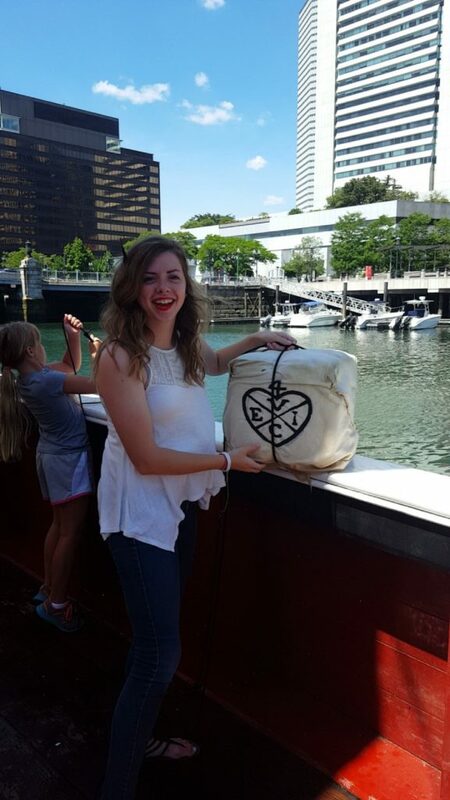 Here’s a picture of Lillian joining the Revolution on a family vacation in Boston.